"Annabelle:Creation" is out in theaters August 11, Thisfunktional is giving away some Fandango Code Carriers tickets. The scariest movie of the summer is out in theaters and some lucky winners will get to watch it for free and to have someone to share in the thrilling excitement each winner will get a Fandango Code Carriers good for two tickets. 1 - A Fandango Code Carriers good for two tickets to watch "Annabelle: Creation." Disclaimer: Multiple winners will be chosen. Contest runs to Aug 13, 2017 midnight. No purchase necessary. Prize provided by Arenas. Only open to the U.S., no PO Boxes or international addresses. Only one entry per household. Entries on behalf of another person will not be accepted and joint submissions are not allowed. We will not accept entries of contestants who have claimed a prize in the last 6 months. 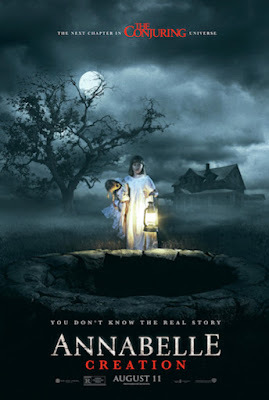 From New Line Cinema comes “Annabelle: Creation”, with David F. Sandberg (“Lights Out”) helming the follow up to 2014´s hugely successful “Annabelle”, which scared up nearly $257 million at the worldwide box office during its run-in theaters. The film stars Stephanie Sigman (“Spectre”), Talitha Bateman (“The 5th Wave”), Lulu Wilson (upcoming “Ouija 2”, “Deliver Us from Evil”), Philippa Anne Coulthard (“After the Dark”), Grace Fulton (“Badland”), Lou Lou Safran (“The Choice”), Samara Lee (“Foxcatcher”, “The Last Witch Hunter”), Tayler Buck in her feature film debut, with Anthony LaPaglia (TV´s “Without a Trace”) and Miranda Otto (Showtime´s “Homeland”, “The Lord of the Rings” Trilogy). Currently scheduled for release on August 11, “Annabelle: Creation” is a New Line Cinema presentation, an Atomic Monster/Safran Company production. The film will be distributed by Warner Bros. Pictures, a Warner Bros. Entertainment Company.